How many times have your loving Persians come and given you a wet face kiss? Most breeds of cats unless short-haired end up with wet chins when drinking — and that can increase the risk of developing chin acne. The best way to avoid dripping chins and damp chest hair is to provide your cat with a water fountain to drink from. There are commercial water fountains available for cats. In fact, I have purchased and tried out two other pet fountains and discovered they just didn't address the needs of a long-haired cat. The fountains were difficult to keep filled, hard to take apart to clean and clogged easily with the hair or food that washed off my pretty feline's face. Also, the design often made it too easy for toys to be knocked in the water reservoir. In fact, I think one of my cats would deliberately bat her toy into the fountain! The bottom line — the design of the commercial fountains still allowed the water to soak the cat's face or chest when it took a drink. So I decided to build a better mouse-trap . . . I mean water fountain: a fountain designed especially for my Persians. I wanted my cats to have running filtered water to drink, while still keeping their hair high and dry. Think about it — no more teaching your cat to drink like a rodent. Or wondering if your cat getting enough water to drink. So . . . I designed and built a terrific water fountain for my cats . . . and you can too! Here is list of items you will need to make your fountain. Obviously you will need a small pump for your fountain. I bought mine at Super Walmart in the pet section for only $9.98. 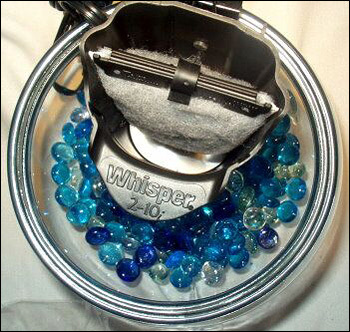 It is a Whisper Internal Filter 2-10i and it is a super quiet, power filtration pump. It uses medium filtered cartridges. NOTE: Be sure to select a product that has an INTERNAL pump. Glass beads are needed in the bottom of the container for your fountain to both anchor it and to fill the water reservoir and filter out large debris. Large particles will go to the bottom of the beads and will not be sucked up by the pump. You will need enough glass beads to raise the pump to the height needed. I used three small 12 oz bags. 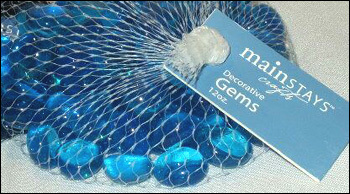 Choose glass beads in a color to coordinate with your home decor - or your cats! The beads were found at Walmart. $2.99 a 12 oz bag. The larger bags are a little cheaper per ounce. It just depends on what you like. Glass beads work better than the rocks. Smooth surface, means no hair to cling to the beads. 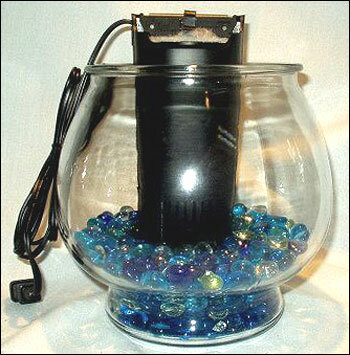 Once you have your pump and the beads you will need a container or reservoir for the fountain. I chose a heavy glass fish bowl found in the pet section of Super Walmart. for only $5.99. The small top of the glass fish bowl is perfect for the fountain. NOTE: You can also use a small plastic critter cage. You will not need the top that comes with it. 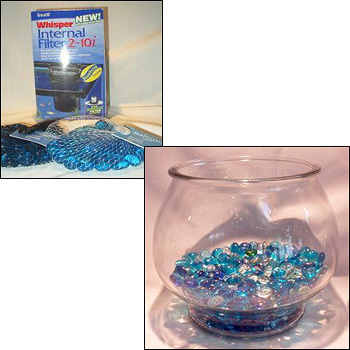 It is smaller and much lighter then the fish bowl, but it will also break and tip more easily. Place the beads in the bottom of the glass bowl. 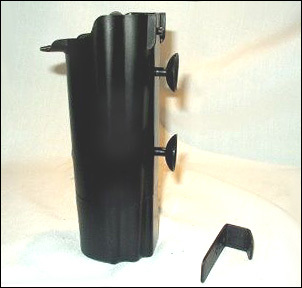 The pump comes with a plastic L-shaped holder on the back and two rubber suction cups. Remove the holder and replace it with one of the suction cups. This will be used to attach the pump to the side of the bowl. Both holes on the back side of the pump will need to be plugged. There should be two suction cups in the box that can be used for this purpose. If only one cup is provided, use it to plug the top hole and then use waterproof caulk or cork to plug the bottom hole. Both holes have to be plugged for the pump to work correctly. Next, place pump in the bowl. Position the pump against one side of the bowl. Add enough glass beads so that the lip where the water exits the pump is slightly above the edge of the bowl and pointing towards the center of the bowl. The lip of the water pump is where your cat will drink from. 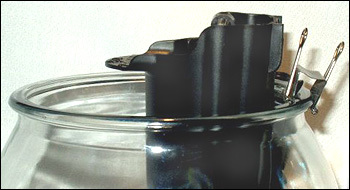 After placing the pump at the correct level, you will need to clip the pump to the side of the bowl. Place the rubber sucker against the edge of the bowl and clip it in place with a large binder clip. With the pump securely in place, there will be a small space around the pump. Water is available as it comes out the pump, but does not pool up to the top of the bowl. This means the cat will need to drink the water falling off the lip of the pump. Drinking in this manner helps keep the cat's face and chest clean and dry. As an added benefit, any hair or loose food that may fall off the cat's face will be trapped in the filter, keeping the drinking water cleaner than if it was in a bowl. Once the pump is held firmly in place, fill the bowl about half way with filtered water. Do not plug the pump directly into the wall outlet. Please use a surge protector. Your cats will be attracted to the sound of the water falling in the bowl. Soon they will be drinking clean filtered water. Even small kittens quickly learn to stand on their hind legs with their front paws against the bowl and lap up the fresh water. You can add water as needed very easily from the top. I have been using this water fountain for my cats with excellent results since 2001. I have also given several set-ups away to a few of my fellow Persians breeders and they are always amazed how their cats figure it all out for themselves. Try building one for your cats. They will have cleaner, fresher, tastier water! And stay drier too!